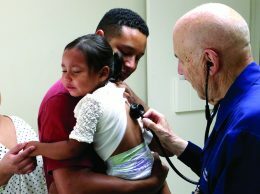 On the eve of a Board of Supervisors vote on the largest bond issue for a capital project in Ventura County history, the county’s financing authority received a AA rating from Fitch Ratings on Feb. 4 for $305 million in bonds that will fund a significant rebuilding of the Ventura County Medical Center. Proceeds will go toward construction of a replacement wing for the county’s public hospital, which is required to undergo earthquake-proofing. The favorable rating sits just below the AAA that marks the safest bonds for investors. It will help reduce the county’s long-term borrowing costs. County officials expect that the bonds will be repaid over 30 years at slightly less than 4 percent interest, though the final rates won’t be known until the bonds hit the market near the end of this month. “There’s a significant difference in borrowing costs relative to a single ‘A’ and a ‘AA’ when you’re talking about well over a $300 million issue. One basis point is $30,000 a year,” said Paul Derse, the county’s chief financial officer. If the bonds are approved and sold to investors, about $20.7 million would be used to pay down debt incurred by the county’s commercial paper program. The $51 million program provides smaller amounts of bridge financing for county projects such as communications systems upgrades, and the debt contained in it carries variable rates. Derse said using fixed-price bond issue proceeds to pay down that paper will lock in today’s lower rates without extending the life of that debt, with a side benefit of freeing up borrowing capacity in the program. “Right now the rates are very low, but so are fixed rates. We’re locking in those fixed rates at this time,” Derse said. Fitch also gave Ventura County an implied general obligation rating of AA+, one notch below the highest achievable rating. Even though the county is not currently issuing a general obligation bond – the hospital borrowings are lease-revenue bonds to be paid with hospital revenues – the ratings agency praised the county’s fiscal management. “The ‘AA+’ implied GO rating reflects the county’s good financial operations, exhibited by a sound financial cushion, years of operational surpluses, prudent expenditure reductions and pension reform measures, and a significant degree of remaining expenditure flexibility,” Fitch wrote in its rating note. One area where Fitch expressed concerns about the county was in its pension program. It calculates the funded ratio for the county for 2011 at 72.6 percent after lowering the discount rate from 7 percent from 8 percent. The Board of Supervisors is set to vote on whether to approve the bonds at its meeting tomorrow. If approved, the bonds could go to market as soon as Feb. 27.